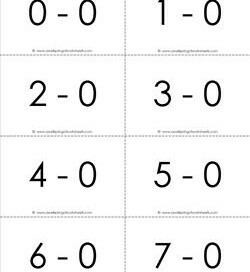 This 2 page set of black and white subtraction flash cards covers the 0’s for subtraction facts between 0 and 10. Great practice for beginners! 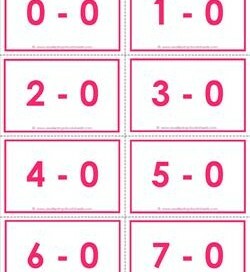 Introducing … subtraction flash cards for 0’s in a stunning pink. 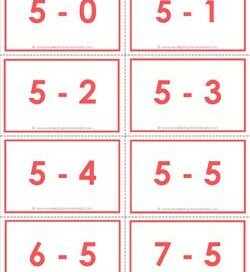 These 2 pages of 11 flash cards have subtraction facts for 0 to 10. 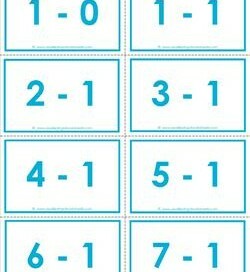 These pretty blue subtraction flash cards are just for the 1’s and include numbers between 0 and 10. Created for first graders to learn fluently. Okay, so here’s the low down … these black & white subtraction flash cards for the 2’s for numbers 0-10, if practiced, will make you really smart! 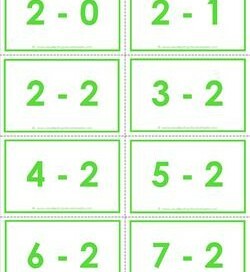 Now, if you use these green subtraction flash cards for the 2’s, you will become even smarter than if you just used the black & white version! Just kidding! Progressing through the colors of the rainbow, these subtraction flash cards for the 3’s happened to fall on yellow. Includes facts for 0 to 10. This soft orange color is a perfect fit for subtraction flash cards for the 4’s. Why? I don’t know, it just sounded good! Includes facts for 0 to 10. Here’s a set of black & white subtraction flash cards for the fantastic 5’s. Includes 11 cards for subtracting from 5 and subtracting 5 for numbers 0-10. 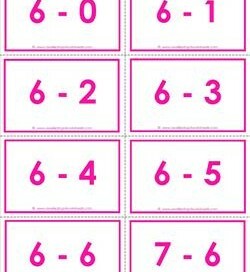 I know you’re just dying to print and use these pretty salmon colored subtraction flash cards for the 5s’. Includes numbers 0-10 for first grade. These subtraction flash cards for the 6’s are here to help you with those foundational and necessary subtraction facts for numbers 0 through 10. 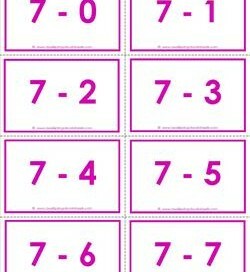 These schnazzy bright pink subtraction flash cards for the 6’s have 8 cards per page. Just right for little first grade hands. Facts for 0-10 included. Have a blast blasting through these subtraction flash cards for the 7’s. Start from 0 and fly all the way through to 10. You can do it. I have faith in you! Lovely lilac for the lovely 7’s. 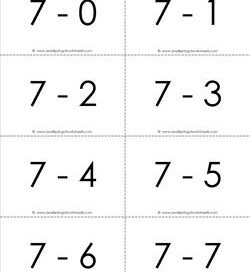 Please enjoy using these 11 subtraction flash cards for the 7’s. Includes numbers 0 -10 to build a solid foundation of facts.